The Pacific War Online Encyclopedia: Wheeler, Raymond A. Table of Contents Next: White, Charles H.
"Speck" Wheeler was one of the most experienced engineers in the U.S. Army prior to being assigned to the Far East in 1941. He succeeded Stilwell as deputy commander of Southeast Asia Command after the latter was recalled in October 1944. (Stilwell's other titles as chief of staff to Chiang Kai-shek and chief of Northern Combat Area Command went to Wedemeyer and Sultan.) 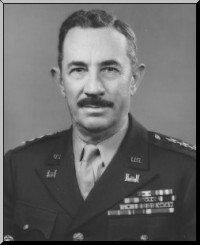 Wheeler ended his career as chief engineer of the Army.